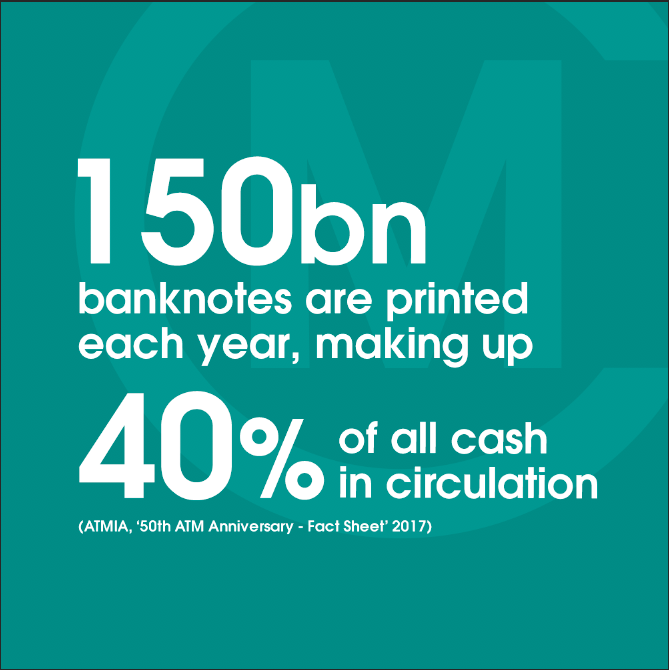 Celebrating 50 years of ATMs, the ATM Industry Association released a factsheet on cash point history, facts and figures. And if there's anything we at Cash Matters cannot live without, it's #CashFacts. Wow your friends, or... bank representatives with your ATM knowledge in honour of the golden jubilee of 24/7 cash convenience! Where to begin, you ask? Start with the weird, we say! Did you know that the creator of the first ATM came up with the design while soaking in a bath and dreaming of chocolate vending machines that dispensed cash instead of chocolate? Did you know that approximately one ATM is installed every three minutes? Cha-ching! A recent study by the ATM Industry Association estimated an average year-on-year increase in the use of cash worldwide over the 2009-2013 period to be 8.9%, compared to anemic economic growth rates below 3% p.a. Currency Research estimates there are about 360 billion circulating banknotes in the world. Around 150 billion banknotes are printed each year and this amount is thought to be around 40% of the volume which is circulating.